For today’s Good Fences meme, I share a picture from Javadhu Hills – an extension of the Eastern Ghats, near Vellore. 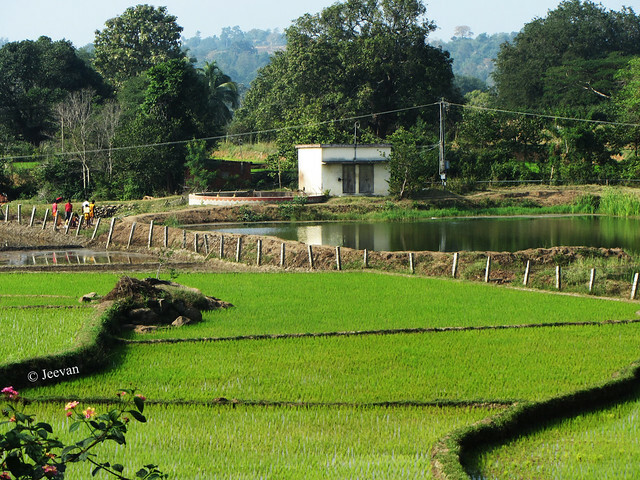 And here’s a fence run across a patch of step paddy fields, adjoining a pool of water near Jamunamarathur – a major village and town that connect many mountainous villages of Javadhu Hills. I visited this place in 2013. Pretty view of the paddy field. Great shot, enjoy your day! It's a very pretty place with beautiful greens and lovely reflections. What a beautiful sight! Lovely shot. It looks like one of our old farm fences in southern Iowa. The green is SO green. Beautiful. Love the simple hand made little fence. I like how the little posts lean this way and that. Very appealing to the eye. What a beautiful view, Jeevan! The green paddy fields are nice to look with the refreshing greens! I see again, you love fences! Wha? There are hills near Vellore? I didn't know about it. Is there a road to go over the hills? Lovely shot of the paddies. Sorry to be late commenting. We had company over the holiday and then I got sick so I'm just now getting around to commenting on GF - What a neat photo. We don't have the "paddy fields" here so it's interesting to see them.